Atlantic hurricane season begins on June 1, but preparedness season is in full swing. Or at least, it would be if the federal government wasn’t shut down. Of all the trouble the shutdown has brought upon the weather community, this might be the most impactful. Putting the off-season on hold over Trump’s imaginary border emergency could result in real life-and-death consequences if a hurricane strikes U.S. shores this year. Last year saw two multi-billion dollar hurricanes hit the U.S.. The year before was the costliest hurricane season in history. Yet losses would’ve been much worse if not for National Hurricane Center (NHC) and the U.S. hurricane program improvements, ranging from narrowing the cone of uncertainty that shows a storm’s projected path to refining response plans. The bulk of those improvements happen at this time of year, when the odds of hurricanes are low and scientists and program managers can turn to long-term projects. The NHC, along with a host of other federal agencies from the Environmental Monitoring Center to the Federal Emergency Management Agency (FEMA) analyze data, tweak forecasts and models, and provide training to local emergency managers, all so every American can get better forecasts and evacuation warnings. All that has come to a grinding halt as the shutdown has dragged on. One of those projects is an annual training organized by FEMA in the winter and spring around the country that brings in people from local and state government responsible for creating and executing hurricane plans. They could be fire marshals, emergency managers, or politicians. The NHC assists with those trainings by providing some basic meteorological knowledge, including how its forecasts and products work and where to find them. The first training would’ve been last week, but it didn’t happen due to the shutdown. “These people wear many hats, and now they’re missing one,” Blake said of the emergency planners who are normally at the trainings. 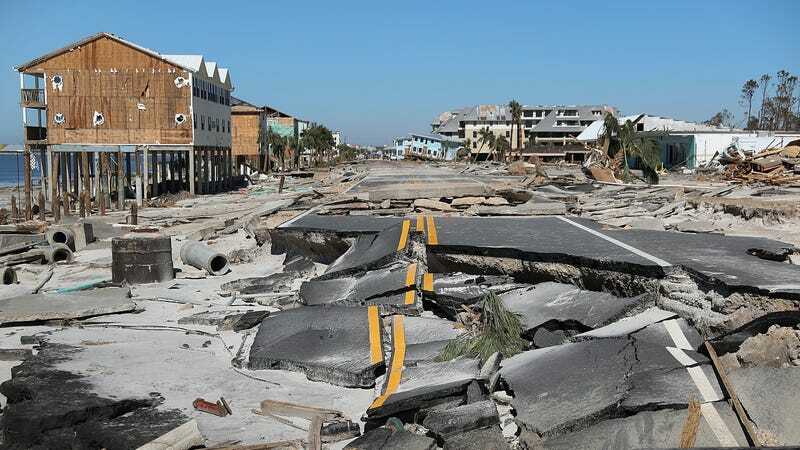 The loss of projects could be equally problematic for hurricane preparedness. The NHC added storm surge warnings to the suite of ways it communicates risk to the public in 2014. Those warnings aren’t yet operational for Puerto Rico, which was lashed by Hurricane Maria in 2017. Blake said the agency had plans to extend storm surge warnings to the island in time for the 2019 season, but that effort’s now on hold and could be scrapped completely. The NHC can’t even advertise jobs for the eight positions it currently has open, including lead marine forecaster, executive officer, and a handful of interns. For a chief scientist position it did have posted, the NHC can’t hire anyone. The National Oceanic and Atmospheric Administration, which oversees the NHC, said in a statement to Earther that the hurricane models weren’t slated for a “major upgrade” this year. But any slight tweaks and talks between the modelers and NHC staff, conversations that could inadvertently yield breakthroughs, are on hold while the shutdown wears on. Projects like the Puerto Rico storm surge warnings could still happen depending on when the shutdown ends and job postings are still likely to go up, but they’ll happen as federal workers face a backlog of work. Not everyone is off the job, however. Blake and fellow employees deemed essential are working without pay to put out maritime forecasts for U.S. coasts and keeping an eye out for any oddball tropical storms that may form in the offseason. But they’re cut off from all their partners that would normally be working to prepare for hurricane season and putting American lives at risk. Blake likened it to a football game, which seems fitting given this weekend’s conference championships. Blake and everyone else working on hurricanes will work like hell to be ready once the shutdown ends. But the longer it draws, the more likely they’ll be using last year’s game plan. And even then, players could still be running around the locker room looking for their equipment when the lights go up on Atlantic hurricane season on June 1.